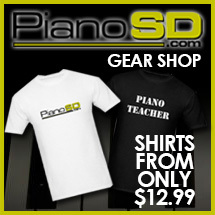 There have been about 6 or 8 major changes since the very earliest days after the invention of the piano. I have located a picture that you may be interested in. This is rumored to be one of the very first pianos. Between the years of about 1790 and leading up to the the years around 1870 the changes that were bought about were changes that would last til today. The original piano only had 5 (five) octaves. These were eventually stretched out to 71/2 octaves in the early 1800’s. There are some manufacturers that have experimented with longer octave ranges like Bosendorfer (for example) and a couple of others. However, these pianos are not in common manufacturing lines. We integrated the use of an iron plate to help with the stability of the piano and assisting in making it last much longer than the older ones may have been capable of. The one piece casting is very heavy with some weighing up to several hundred pounds. Originally the piano either did not have a plate or a wooden plate. I am sure that when this was originally done the enthusiasts of that day thought this was a horrible idea and that the piano had been ruined. The hammers which had been made of leather gave a very tinky sound because of the hardness of the leathers. Early in the 1800’s it was discovered that you could use hammers made of felt. The felt hammers would increase the tone of the piano (notice that I said “increase the tone” and not “increase the volume”) and this gave the piano a much richer tone than the piano that Cristofori had brought to us earlier. Over the next few days I will be telling you more about the history of the piano and fill you in on the other changes that the piano was about to undertake. Cristofori had made a HUGE impact on keyboard instruments by inventing and producing the first of what would become known as the piano. Although the initial pianos were an incredible feat, there was an incredible difference between what was originally created and what we now know. The first actions were different in many ways. First, the sound was not as strong as what we presently enjoy. There were a number of reasons why. One of the reasons was that the soundboard of the piano was made differently and the ability of the artist to project at the volumes that are now possible was not possible with the soundboard of that era. Strings were another issue. At the time, the string makers had not yet made it possible to produce strings with the diameter that are produced presently. They did not have the technology to understand that the bass strings could be wrapped with copper and the inside diameter of the strings could be increased in order to make a larger sound. The biggest differences would come in the action of the piano. The action of that era was not only uneven but, the hammers were not controllable. The hammers could not strike the strings with the same velocity and with the same power that we have now. The action was somewhat more fragile and strike points were somewhat different and all of this added to the resistance that the artist felt when he/she began to play. It has been said that “they just aren’t made like they used to be” and that is very true. When I am asked my opinion I often respond with “you are correct. Its better”. I hope to be able to explain this in more detail in the next few blogs. The idea of having strings attached to another piece of wood that made sound had been around for years but the idea of having a keyboard was not truly developed until around the 1400’s. For the next 300 years (give or take a year or two), the harpsichord was the instrument that set the “bench mark” for keyboard instruments. Sure, there were many other instruments that came and went, a small portable harpsichord, and variations on the harpsichord did come on the scene from time to time and their popularity came and went, but the harpsichord was the instrument that was to be the traditional instrument for many composers and artists to use not only for “pop” music but also for worship in local churches and houses of worship. The idea of the harpsichord was that the hammers moved forward to the strings, the strings were then plucked as the hammer returned to its resting point. This was the standard sound that was heard but there were a few problems with this that necessitated a different technique in producing sound. One of the biggest problems was that the sound could not be made softer or louder. This made it very difficult to write music that allowed feeling. Sometime in the early 1700’s, many people believe it was between 1707 to 1712 that a man by the name of Bartolommeo Cristofori came up with the idea that the hammer could move from its resting place, come forward and strike the string, and return to its resting place in one very fluid movement. 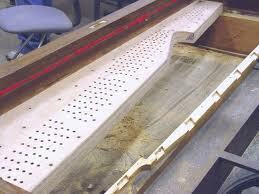 This was the beginning of the piano as we know it today. Lots has changed since that day and many things have stayed the same. I will continue this series to help inform you of the origins of my passion. As promised I am going to explain a couple of things about piano parts. Tonights discussion is pinblocks. For many years sales people have used certain terms to describe different parts of the piano and would use that information to develop a sales pitch. Salespeople to this day continue to use certain phrases as if they have some type of exclusivity to these parts or that no other piano has these parts. Pinblocks are one of those parts. Pinblocks ( at least all I know of them ) are made of hardrock maple, multi-layered and cross-grained to supply support. Pinblocks are the part of the piano that the pins go into that hold the strings in place. Each pin is placed in a scientific location and then pulled to a predetermined pitch to create a sound on pitch. 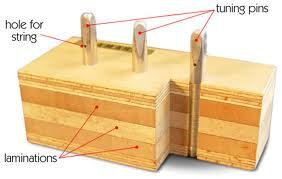 Every piano has a pinblock and is used for the same purpose. The location of the pinblock is the same and they are all made of the same materials. The differences in pinblocks come down to how many plies of hard rock maple are used for these pinblocks. Some pinblocks are made of up to 18 plies of hard rock maple while others are made of up to 5 plies of hard rock maple. As far as my knowledge is concerned, all piano makers use hard rock maple as their wood of choice. The reason we use wood and not some other material is that wood will move and breathe with the change in climates and while it will go out of tune, most makers would agree that the use of any other material could cause the strings to break or lose their integrity quicker. When sales people talk to you sometimes they make you feel as if their piano is the only one that has this. It’s not. Every piano has a pinblock. It is really important to understand terms when you go to shop for a piano or when on occasions your technician may want to talk to you when tuning. One thing I do want to point out is the construction of the pinblock, in a new piano or a used on in particular is probably the most important part of the piano. It’s location is such that it will require you to take the strings out of the piano, then the plate and finally the pinblock when you have to replace one. It is one of the most difficult parts to repair and replace.